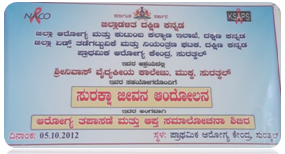 We (Dakshin Kannada/Mangalore DAPCU) have been involved in the planning of district level sustained campaign on HIV. As a part of this process we studied the programme data and decided to focus on two taluks i.e. 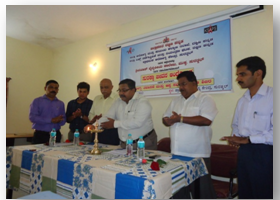 Mangalore and Bantwal for STI Service Uptake and ICTC demand Generation. Mangalore and Bantwal have an industries and port belt that attracts migrants from not just across the state , but also the country. The campaign plans to reach migrants as well as residents in select identified villages. Pre-launch:As a part of planning process we had a consultation meeting with the DC, CEO and other department heads and they have whole heartedly supported this campaign. Pre-launch publicity was done by printing pamphlets about campaign and distributing it to the households by local ANMs, ASHAs,Anganwadi workers, Link workers and NGOs . Publicity was also given during the folk programme one week prior to the campaign. A press release about the campaign was given in the local newspapers. Sessions for adolescents took place at the ARSH clinic and later in a nearby school. 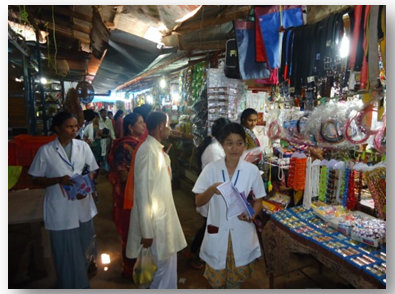 Nursing college students helped in distributing pamphlets at Surathkal market, Auto and tempo stand at Surathkal. More than 100 shops were visited by the students and they gave given information about the campaign and its intention. A unique feature of our campaign is that the resources for the campaign have been generated within the district. Medical colleges have been mobilised and their team will be deputed for support at the PHC level. STI and HIV testing services at the PHCs are being publicised. Industries have sanctioned inclusion of HIV in the training of their workers. We will update you through this blog on the progress of the campaign in the next two months.